The University of Tokyo Atacama Observatory (TAO) is to be built on the summit of Cerro Chajnantor (18,500 ft). Base camp for workers (to build and operate the Observatory) is in the city of San Pedro (7,900 ft). Continuous travel over 10,000 ft of elevation exposes workers to intermittent hypoxia. My team was tasked to determine a solution to how scientists and workers could live and work at the TAO site without experiencing large adverse health effects at altitute and when they re-acclimate at base camp. The solution my team proposed was a habitat that maintained the pressure at base camp, in addition to an "Extra-Vehicular Activity" (EVA) ability to work outside the habitat while maintaining the same partial pressure of oxygen (ppO2) as inside the habitat. Additionally, a sensor suite that monitors physiological changes can be used to adjust con ops of the mission. The development of this concept required the need of user input from workers in Chile. This, combined with background literature and consulting from Guillermo Trotti, an extreme environments Architect, helped define our design. Interviews with workers, researchers, and members of the University of Chile led to requirements that our solution must satisfy. These included, maintaining 850 millibars of pressure at altitude, a crew size of 5, between 3 and 14 day mission lengths, ability to go in and out of the hab 5 times per day per person, must not damage the terrain, and all radio must stay at ~60 mHz range to avoid frequency pollution. 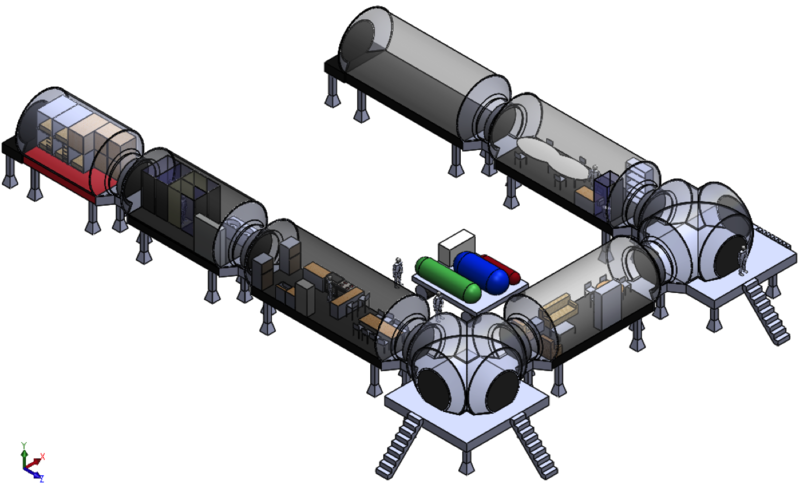 The NASA Life Support Baseline Values and Assumptions Document and the NASA Human Integration Design handbook were used in the calculation of the life support system. The combination of (1) Top-level design variables, (2) concept of operations, (3) Human consumption and production estimates, and (4) safety limits led to the derivation of the ECLSS requirements. Two existing habitats (HI-SEAS and Mars 500) were studied as analogs to ours. Habitat research was provided by our architecture consultant. The habitat I designed has a total of 922 cubic meters of volume and composed of independent modules pieced together (bedroom, kitchen, office, etc.). 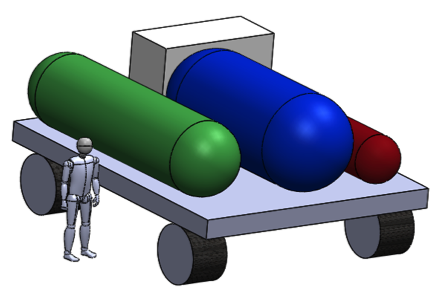 The module platforms are restricted in size to a flat bed truck for easy transport. 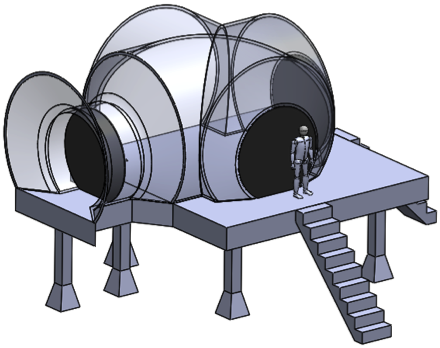 The modules allows for different configurations and expandability of the habitat. Connection platforms connect modules and isolate modules in case of emergencies. Raised platforms allows for easy placement and removal of the habitat, as well as minimize damage to the land. A centralized ECLSS system on a hitch can be easily towed and replaced. 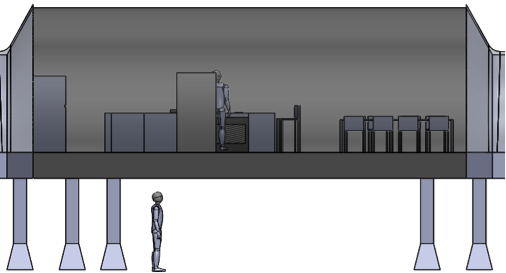 The configuration above is sized to have enough storage and consumables for a crew of 5 for 6 days. 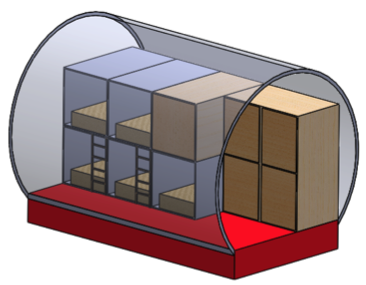 Airlocks separate work modules from habitation modules and minimize the loss in total pressure when entering and exiting the habitat. The ECLSS trailer is sized for 6 days and uses a trailer to store air, water, and waste. Japanese "Bedrooms" were the inspiration for private, individually ECLSS controlled sleeping quarters. The modules allow the habitat to be reconfigured and expanded in case crew size increased. Workers needed to do work outside the habitat, and in order to do eliminate any intermittent hypoxia effect, we needed to maintain the same ppO2 between the habitat and EVA work. There are two ways to do this; (1) Add pressure on the body similar to a space suit to increase ambient pressure or (2) adjust the concentration of oxygen the workers are breathing. Models using the Alveolar Gas Equation derived that if PaO2 was held fixed, a "space suit" would only need to provide 74.8 millibars of pressure on the skin. This pressure could be supplied with athletic compression garments under the workers already bulky clothes to keep them warm at such high altitudes. However, to decrease the time it takes to get ready for an EVA (compression garments are very difficult to don and doff), a conceptual helmet was designed. 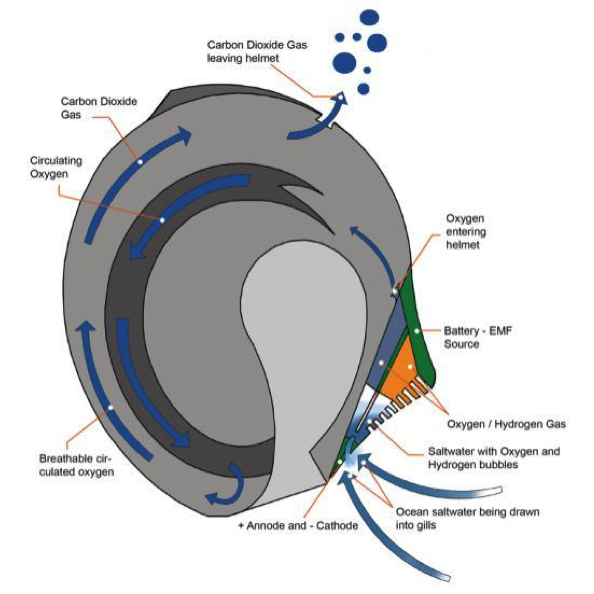 This helmet would use an oxygen concentrator and a nitrox stik to convert the ambient air into higher concentration oxygen to maintain the appropriate ppO2 needed at such low pressures. The inspiration for this helmet came from the Immersed Senses helmet design by Adam Wendel in 2010. Although a final sensor suite design was not completed, Solunava, a Chilean based electronics company, took over the design and will continue to prototype this sensor suite. Our team developed a list of parameters of interest needed to properly try and predict eminnent intermittent hypoxia effects. These six parameters are body core temperature, heart rate & heart rate variability, blood pressure, oxygen saturation, carbon diaxide saturation, and activity intensity.